Greetings and Happy Thursday! Yesterday I ordered a new door knob for the pantry door at the lake. 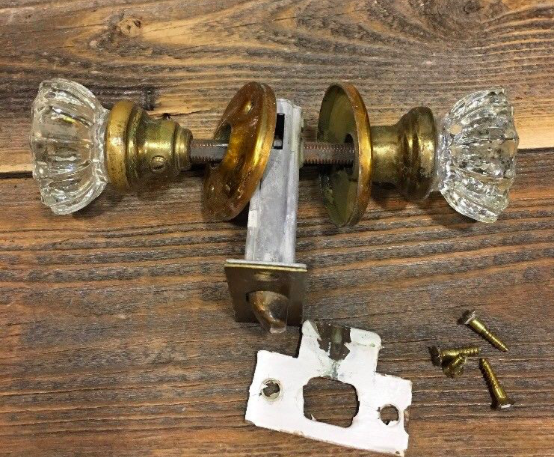 More accurately it is an old vintage door knob. When I couldn’t name a few of the parts, I started researching the anatomy of a door knob. Come see what I found! For years I’ve wanted to replace the pantry door knob at our lake house, aka Happy Hill. The current door knob is fine, but it’s from the 70’s no doubt and is gold and uninteresting. To add insult to injury, the door itself is a hollow core door. But rather than replace a perfectly good door, I”m dressing it up a bit. Formerly it was yellow and I painted it white. I added my pretty chalkboard to the front. This serves double duty. It hides much of the door and we use the chalkboard all of the time. But back to the door knob. I bought this one on eBay. It looks like it’s in great shape. Except for the white thing. It appears I’m going to need to replace the white thing, but first I need to learn what it’s called. I found this chart. Ahah! The white thing is called a strike plate. Yep, going to need a new strike plate. I found these vintage escutcheon plates on eBay, but I have some similar in my Treasure Room. Once the door knob arrives I’ll pick which one fits and looks the best. Speaking of vintage door knobs, this beauty is on the inside of the front door at Happy Hill. This is part of the reason we bought the house. (well, for me.) The knob, latch and hinges appear to be really old. At some point we will need to replace the door, but we will save and reuse this hardware. Naturally. These are the door knobs on the master bedroom closet. They are dummy knobs meaning they don’t turn and don’t you love the escutcheon plates? Again, they are purely decorative. I found these on eBay as well. I’m thinking the new door knob for the pantry door will look similar to these once installed. Now that we are all experts in door anatomy, I can now look up specific parts that I need for future door knob projects! I’m thinking I may be able to use the existing strike plate on the pantry door and that will at least save me a little bit of time and money! I’ll let you know how it looks as soon as I/we install it. I’m sure my husband can’t wait!